Quantum chemistry is the application of quantum mechanics to problems of molecular structure, energetics, properties and spectra. 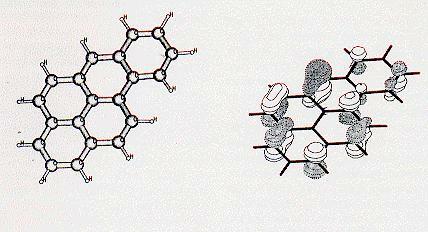 Computers and quantum theory often provide information on molecules and ions that complements experimental data. Advances in theory and computational technology have made quantum chemistry into an indispensable component of modern chemical research. For this reason, chemists with theoretical and computational skills now work in a variety of industrial, government, and academic settings. Students in the Ortiz group learn the methods of quantum chemistry and acquire many computational skills. Close collaboration with senior members of the group and ample facilities enable new students to gain experience rapidly. Creativity is developed by encouraging independently formulated projects. Depending on the interests and talents of the student, dissertation research may emphasize any of the following areas. Benzo[a]pyrene and the Feynman-Dyson amplitudes for its lowest ionization energy. Díaz-Tinoco, M.; Corzo, H. H.; Ortiz, J. V. "Electron-Propagator Methods for Vertical Electron-Detachment Energies of Anions: Benchmarks and Case Studies", J. Chem. Theory Comp. 2018, 14, 5881. Ortiz, J.V. "Interpreting Bonding and Spectra with Correlated, One-Electron Concepts from Electron Propagator Theory", in Ann. Rev. Comput. Chem. 2017, 13, 139, D. A. Dixon, ed., Elsevier, United Kingdom. Díaz-Tinoco, M.; Dolgounitcheva, O.; Zakrzewski, V. G.; Ortiz, J. V. "Composite Electron Propagator Methods for Calculating Ionization Energies", J. Chem. Phys. 2016, 144, 224110. Dolgounitcheva, O.; Díaz-Tinoco, M.; Zakrzewski, V. G.; Richard, R. M.; Marom, N.; Sherrill, C. D.; Ortiz, J. V. "Accurate Ionization Potentials and Electron Affinities of Acceptor Molecules IV: Electron-Propagator Methods", J. Chem. Theory Comput. 2016, 12, 627. Corzo, H. H.; Galano, A.; Dolgounitcheva, O.; Zakrzewski, V. G.; Ortiz, J. V. "NR2 and P3+: Accurate, Efficient Electron-Propagator Methods for Calculating Valence, Vertical Ionization Energies of Closed-Shell Molecules", J. Phys. Chem. A 2015, 119, 8813.